Korsun. 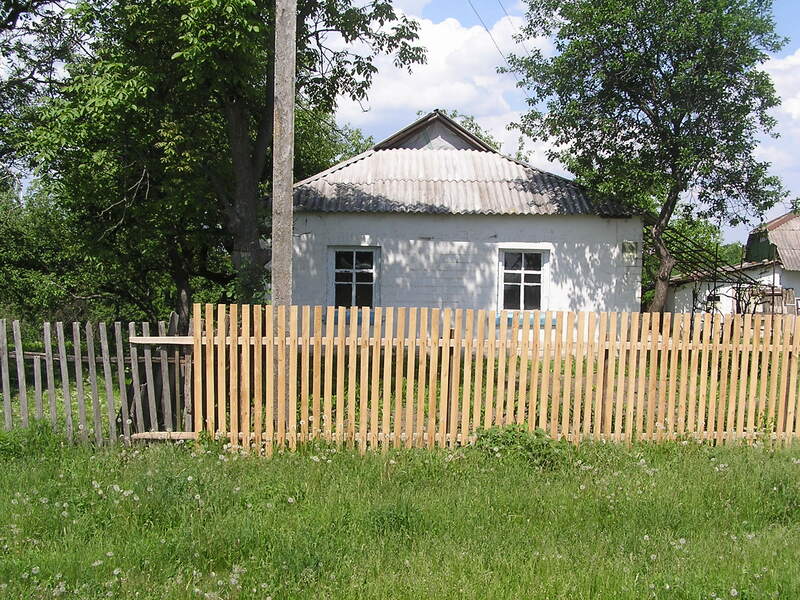 House aged from mid-19th century similar to those where the Gnoyenskys lived. Year 2007-2011. My grandmother laughed at my horror that she had grown up without electricity or running water. As nonsensical as it sounds, for a long time I doubted that, under those inadequate conditions, she could really have experienced the young passions and feelings that I did. My grandchildren cannot quite comprehend life on earth without a cell phone, at least a meaningful life – as far as they are concerned, I spent most of mine meaninglessly. To be fair, they do say that I’m cool. As ancestors go, that is. It was the article in the Newspaper Nadezhda. Dec, 2016 issue (Nadezhda is Hope in Russian) that put me in a philosophical mood. It’s called “A Historical Mystery. Romeo and Juliet of Korsun: In the Book and In Real Life” by Klavdia Kolesnikova. “This story shows how small our world is,” she begins, “and that most people are related: to prove it, just explore your roots.” With impressive analytical skill and even more impressive patience she sifts through the myriad of facts to assemble a family story. Klavdia combined information from Romeo’s son’s memories he shared with me, from my family tree, and from Anna’s Shtetl by Dr. Lawrence A. Coben. He based the book on interviews of 90-year-old Anna Spector, our Romeo’s first cousin. 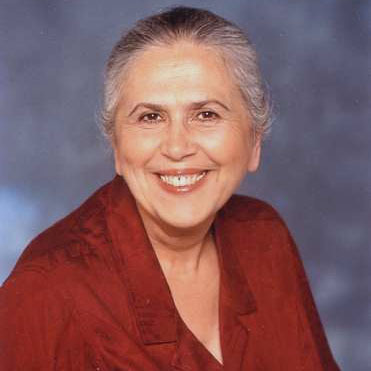 She had immigrated to the United States from Korsun when she was 14. 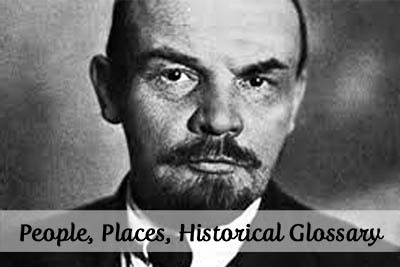 The plot unfolds in Korsun, a town now in Ukraine, then in the Tsarist Russia. Romeo is a cobbler’s apprentice, a son of a cheder teacher. Juliet is the first cousin of my maternal grandfather and namesake; her father owns the largest houseware store on the market square. 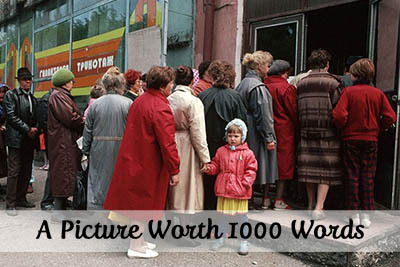 Her dowry of 1,000 gold rubles (in the 1910s!) speaks for itself, therefore a poor son-in-law is out of the question. After Romeo deserts from the tranches of WWI, the couple elopes to Kiev forfeiting the dowry that the Bolshevik Revolution would have swallowed up anyway. They have six children, two of whom survived and now live in the United States where I found them through my research. Ironically, Juliet’s mother and siblings end up living with her in Kiev. Shakespearean passions but with a happy ending! 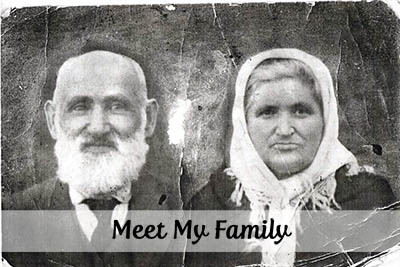 I’d be happy to translate if you are interested in history and family stories – just ask. 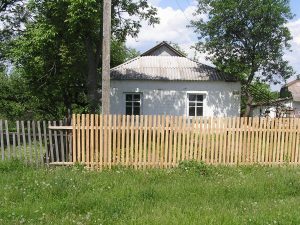 As you know from the photo albums on this site, my research took me to my family’s ancestral towns (shtetls), Korsun one of them. Like many others, my parents migrated to big cities in the 1920s. The farther their shtetl lives retreated, the more idyllic, wholesome, and cherished they became to them. But not to me. Those bygone places were far-far removed. 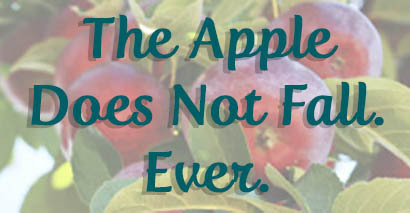 At exodus time, the Jewish inhabitants had turned off the lights, leaving behind nothing, besides cemeteries. And even that was uncertain—considering the diligence of the Nazi and the enthusiasm of their local mates, who would visit the graves except those who still vandalized them? So, my one-day excursions were meant simply to let my descendants see photographs of towns mentioned in our family story. I was dazed by how homey these bygone places felt, as homey as though I had never left them. A well in the backyard. Korsun, 2011. 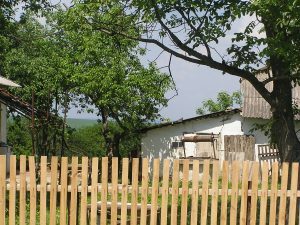 The typical Ukrainian houses with wells, outhouses, and firewood in the backyards. 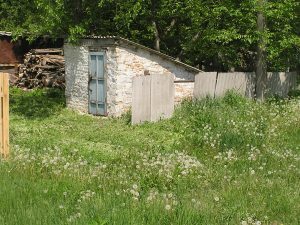 Backyard with firewood and outhouse. Korsun, 2011. 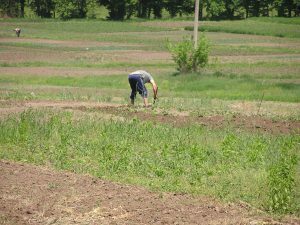 The peasant women working the sparse fields alone—wearing pants not skirts in a nod to modernity, but alone. Working the fields near Korsun. 2011. I discovered the Jewish life not merely alive in these towns but active and feisty—the lights had never been turned off, except in my imagination. In the aftermath of the Soviet Union collapse, the individual communities united into a Regional Association. Korsun. Jewish Community Service. Year 2007-2011. The founding ceremony took place under a chuppah, symbolizing the unbreakable commitment of its members to their faith and to each other. teaches Hebrew and traditions, organizes activities, collects historical data and artefacts. There are no funds to make a visible dent in the upkeep of the old cemeteries, but some work is done. 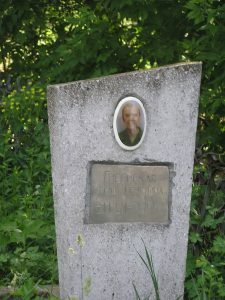 Grave site of Ginda Gnoyenskaya, a cousin. Korsun cemetery, 2007. In Korsun, I saw my mother’s maiden name on some cared-for graves of my distant cousins of whom I was not aware. 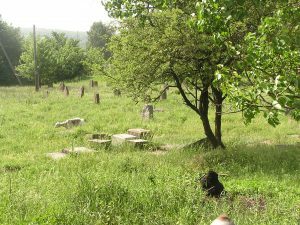 Between the still-standing half-sunk gravestones, goats grazed contentedly. Old Jewish cemetery. Goats grazing. 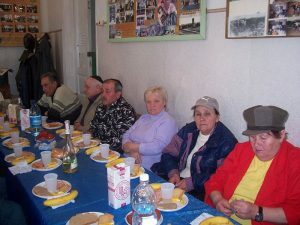 Korsun, 2007. Quarrels with their Christian owners who preferred to pasture their animals on the Jewish cemetery only exacerbate tensions. The president of the Association, Peter Rashkovsky, is a Korsunite. Peter Rashkovsky, the head of the Regional Association of Jewish organizations. On the wall (left to right): the organizational chart, the map showing member-communities, the list of leaders of member- communities. Korsun, 2007. 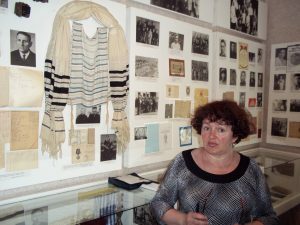 So is Klavdia, the editor of the newspaper Nadezhda and the curator of the Jewish Heritage Museum. Museum of Jewish Heritage. 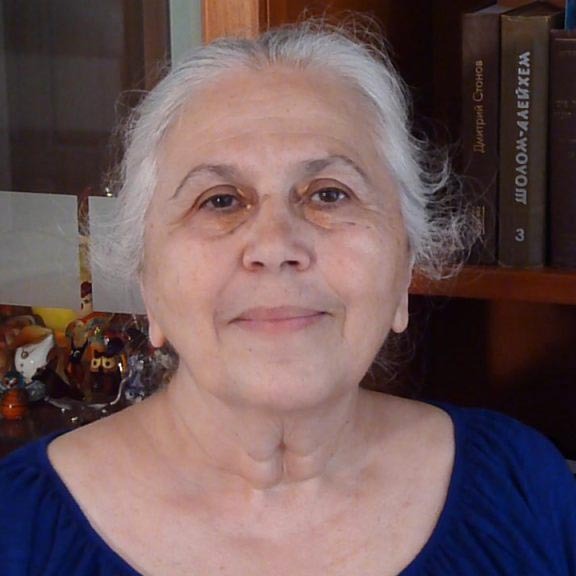 Founder: Klavdia Kolesnikova. Korsun, 2011. They offered up some precious details about my ancestors. Although in family research every new fact is a lottery win, Korsun also rewarded me with infinitely more—promise that no one would be forgotten. Thirty years of the capital city of Kiev and forty years of air-conditioned America notwithstanding, I know I would fit right in, here in Korsun. 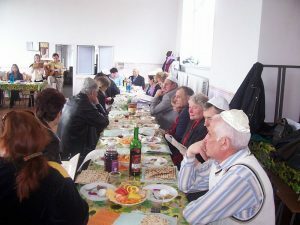 Lunch for the Jewish community. Korsun, 2008. I also know what I would do – work for the newspaper and the museum. If Klavdia would have me, in spite of my Russian that lost its luster and my zero knowledge of local life. 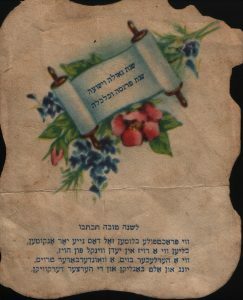 Old Rosh Hashanah (Jewish New Year) greeting card. 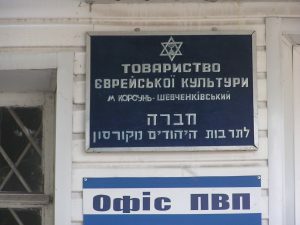 Exhibited in the Korsun Jewish Museum. Contributed by Klavdia Kolesnikova.